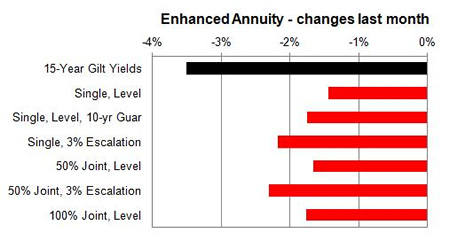 Annuity rates fall 2.3% on average after significantly lower 15-year gilt yields reducing by 35 basis points to a low of 2.70% as investors seek safe havens following worsening conflicts in the Middle East and Eurozone deflation threats. The 15-year gilt yields decreased by 35 basis points to 2.70% during the month sending annuity rates to a new low for the year. August is the first time since June 2013 that the year-on-year change is now downwards ending the strong recovery in rates seen during 2013. The Eurozone is gripped in deflation fears after inflation falls to only 0.9% following a weaker European economy. Investors are moving funds to safe havens such as US Treasury notes and UK government bonds and gilts as there are further suggestions the European Central bank (ECB) may resort to Quantitative Easing. Quantitative Easing involves printing money to increase liquidity in the market by buying long term government bonds and gilts which increases the price and decreases the yields. 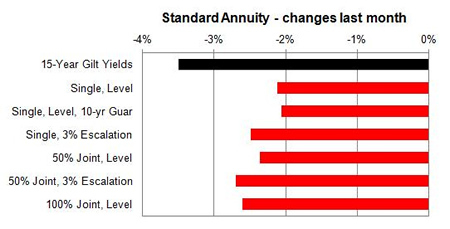 Standard providers decreased their rates on average by 2.30% and we would expect so see further falls of 1.20% in the short term and in the medium term of 3 months annuity rates will decrease by 1.77%. Smoker and enhanced annuity providers decreased their rates by 1.79% on average with a decrease of 1.71% possible in the short term and in the medium term of 3 months we can expect a decrease of 2.57%. Equity markets started at 6,730 and increased by 90 points to end at 6,820. This represents a 1.3% rise and for people that remain invested will still see a fall in their annuity income as the fall in rates surpassed this figure. This month 100% of annuities for both standard and as well as enhanced and smoker rates reduced. Significant decreases were experienced for all annuitants and in particular those in good health aged 70 for single and joint life rates. Standard annuities have been decreased aggressively across the board for all ages and very similar for all types of annuities. For enhanced and smoker rates the largest fall was 3.1% for those aged 55 and 60 where the annuity includes 3% escalation. Impaired providers decreased their rates by up to 2.0% although some medical conditions have not been changed yet. See Annuity Rates Review For the latest updates.